First expectation: Real estate investing is passive. The reality is that creating the type of rental property to the point where it’s passive income takes a LOT of work. But the work is, at times, still ongoing. Eventually you’ll have a vacancy. Eventually you’ll need to fix things up again. Nothing will last forever. Sure, you can get a property manager who’ll handle much of this for you – but you will need to do SOME work yourself, even if it’s as small as choosing between finishes or approving bids on work. It won’t be an insane amount of work, but it will be something. So yes, real estate CAN be fairly passive…but it’s not passive if you don’t put in the work UPFRONT. Second Expectation: In order to invest in real estate, you need to do the repairs yourself or be a good handyman. The reality is that I can’t do anything besides change a lightbulb. While I do know some landlords who do the work themselves to save the money, this is absolutely not a requirement – and depending on how much your time is worth, it’s often cheaper just to pay someone else to do it the right way. It’s also worth noting that since all these repairs are a write off, you can write off the costs against your income…but, if you do the work YOURSELF, you cannot deduct the cost of YOUR OWN LABOR. Third Expectation: It takes a lot of money to start. The reality is that it often takes 10%-25% down to begin investing in real estate. This COULD be a lot depending on your definition of “ a lot,” and also on your area. Buying a property in Los Angeles would be significantly more expensive than in Kentucky, for instance. Where one person might be able to buy a property for $20,000 down, someone else might need $200,000. Fourth Expectation is that it’s often like the TV shows. The Reality is that it’s NOTHING like what they portray on TV. Oftentimes those TV shows will be loosely scripted around creating drama and creating a show that’s actually interesting enough to watch all the way through. Every episode needs a goal, a problem that arises, a solution to that problem, and then a resolution at the end. The real life problems that come up just aren’t that exciting or interesting. It’s often boring and mundane. The fifth expectation is that you’ll make a lot of money investing in real estate. 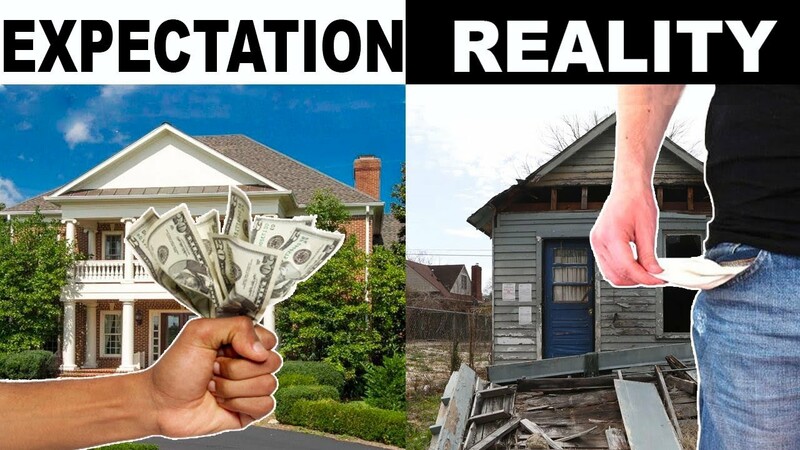 The reality is that oftentimes one property won’t make you rich. Most mom and pop landlords won’t make a lot early on, but as they scale up, they can earn a significant amount of money from a lot of smaller sources. This is how many landlords start making money, enough to quit their jobs and invest in real estate full time. It’s growing your portfolio over one or two DECADES and accumulating those properties that might make you only $900 a month….but buy one of those every 18 months, and in 15 years you’re making $9000 per MONTH. That’s how most landlords make their money, and make a LOT of it. But the beginning will be slow and frustrating until you begin adding more and more to your portfolio.